Permit me a moment of ekphrasis. 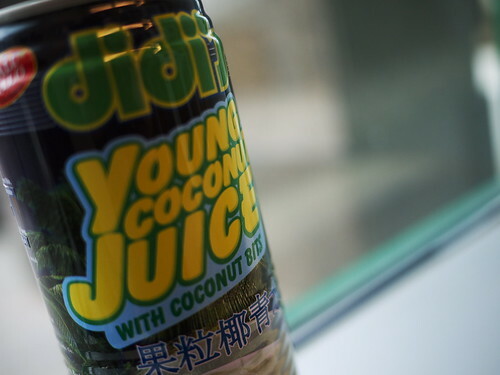 This is a picture of Young Coconut Juice with coconut bits. I checked, and yes, there are coconut bits. 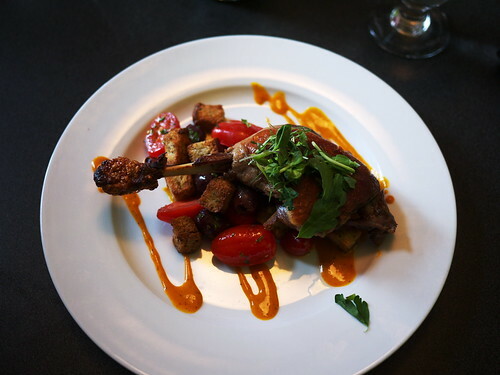 And here is a duck confit with cherry tomatoes, black olives and croutons in a seabuckthorn gastrique. I’m not going to tell you that I sat down for lunch today in my suit and pretended to enjoy the duck but secretly craved a can of Didi’s Young Coconut Juice (with coconut bits). Because that duck was awesome. The ingredients made no sense together but worked anyway. The gastrique was sweet, sharp and unfamiliar (seabuckthorn?). And the duck meat slid off that frenched bone like a cocktail dress at 3 a.m.
As for the juice, it was a choice between coconut bits and coconut jelly. I suspect the bits are there so you won’t question it when small solid lumps suddenly hit your tongue when you take a swig. But man, was it good. There’s even a faintly disgusting pleasure when one of those pieces of coconut end up in your mouth. These are the kinds of experiences that complicate restaurant reviews (which is a thing I do). Forget about sorting through the overwhelming bits of information that make up a judgment on a restaurant - it can be hard to come down one way or another on a single dish. I have plenty of friends who are harsh judges of restaurants. They walk in with a set of criteria that pretty much guarantees them a lousy experience. This baffles me a bit. Bars are noisy, movie theatres are godawful - why rob yourself of one of the few urban pleasures that doesn’t involve underground fight clubs or Alcoholics Anonymous meetings? The best way I’ve found is to meet the restaurant on its own terms. This does not mean abandoning expectations of good service and decent food. Nor does it mean that you’re there to praise or damn an establishment (unless it’s in dire need of one or the other). It’s about getting a sense of what each place is trying to do, and the care and attentiveness they take between getting boxes of food in the back and turning all that frozen, fresh and processed stuff into something that looks half decent on your plate. I’d say that a happy kitchen makes great food, but I’ve eaten at places where the kitchen manager and the chef and everyone there are engaged in lovingly turning out the worst crap I’ve ever eaten. And then there are miserable places that still produce a great burger. Maybe it’s just what my tongue tells me each time. I’ll work it out at some point.